Seeing that everyone in this Buzzfeed generation is addicted to lists, I thought I would generate another easily digestible seasonal tasting menu, this time on the subject of linen suits. I recently included linen suits as one of my Ten Style Commandments of Summer, as one of the underworn and underappreciated joys of warm climate attire. However, before you prepare yourself for more eulogies on the merits of linen, this will not be some deep, detailed treatise. In my view, enough has been written about ‘why linen’ to last several years at least. 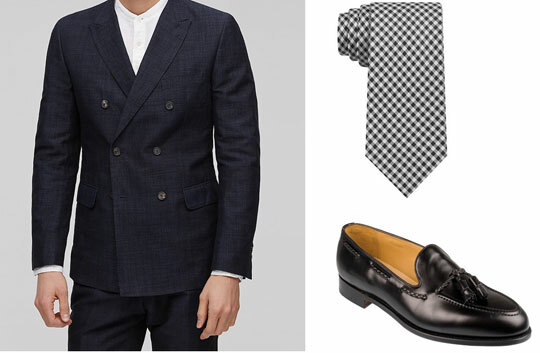 Navy blue is one of the smartest colours of suit you can wear. Along with dark and mid grey, it is the one colour that is entirely beyond reproach in the context of a boardroom. It’s all very well for those in creative positions to turn up in royal blue and sage green, but for many, the business uniform must comply either with a formal policy, or with an implied expectation that you won’t embarrass yourself, or the company. A shame? Maybe. But it is better to be safe than sorry. One of the compromises of linen is that it is markedly less formal than wool. One of the consequences of this is that many are unsure of deploying it in a business context – attending meetings, conferences and the like. Double-breasted suits have a more military formality than single breasted variants, which counteracts the informality of the fabric. 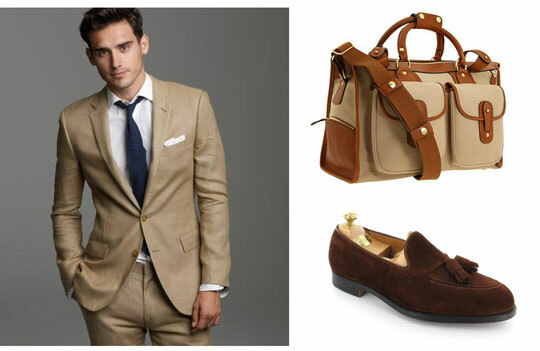 Khaki linen is the classic linen. It is the Hollywood linen. It is the fabric of Somerset Maugham novels, Old Havana gangsters, the British Raj and the Happy Valley Set. The word itself is Urdu and roughly translates as ‘dust coloured’, and it has its roots in 19th century military camouflage. Not as impractical as white or off white, and not as heat absorbing as darker colours, khaki is one of the most resilient colours for linen, which makes it an excellent choice for a travelling suit in the summer months. I find linen one of the most comfortable things to wear on a plane, being very breathable and very low maintenance compared with wool, which needs to be well pressed in order to be remotely acceptable. A khaki linen allows you to go from gate to guestroom without humiliation. Picture the scene: a summer terrace party, mojitos are being served; attractively groomed ladies flit back and forth in floral printed dresses. A golden, early evening sun warmly illuminates the scene. This is the perfect occasion for that special rarity: the brown linen suit. Linen is often seen as a utility fabric: need to keep cool? Wear linen. Need to wear something less precious for travelling? Linen looks good even wrinkled. But it can also be marvellous as a material for contrasting with other fabrics, like cotton and silk. Brown linen has a wonderful lustre in the late sun, like a delectable chocolate truffle. It also contrasts deliciously with light blue, white and pink, and it seems to work very well with silk ties. 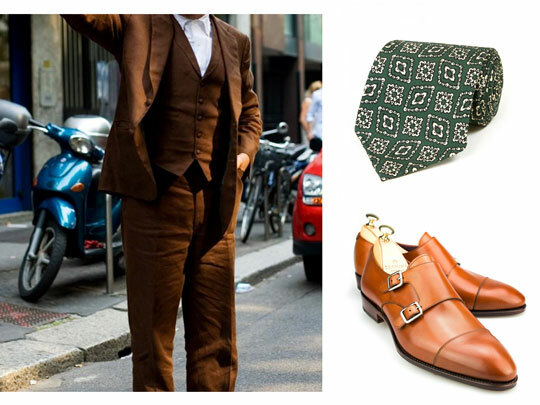 This makes the brown linen suit the most arresting choice for a party. It has a vintage air to it, lending itself to the kinds of cocktail party environments so popular today, and has a distinctly more formal, evening quality than the aforementioned, utilitarian khaki. A medium weight linen is the only suitable weight for suiting cloth really. Anything between 240 and 290 gsm. Lighter weight linens are used more for things like pocket squares. The crucial thing is the lining: if you get a half-lined or completely unlined suit, you will need a decent weight linen to maintain a bit of shape in the absence of this, but it would be substantially cooler than wearing a lined suit in a lighter weight cloth. It’s 105° today and I am loving my unlined seersucker but can’t wear that everyday. Need more to choose from and have just started to look at linen so this is very timely! Thanks! !